I don't think I need to say more about this project, than the post title. I adore it! Let me show you why. Look how cozy it is! I am so glad I decided to add a zip instead of a the knitted strap at the top of the garment. I've been wearing this as a jacket in our cold Spring weather and it has worked perfectly when zipped right up. If the jacket was only fixed at the top, like the pattern, I think it wouldn't be warm enough when it is cold enough outside to wear this. The jacket is immensely warm because of the dense and fuzzy fabric. The camel content in the yarn is definitely going to pill, in fact it already is, but, it makes for a wonderful warm fabric, so I can't and won't complain. In order to have full flexibility with the jacket, I decided to install a two way zip. I love that I can wear it fully, or part, closed. In fact, you can zip it so it looks like it would if it were held together at the top the way it was designed to. I cannot say how much I love the look of this cable pattern. I particularly like the nice flare on the sleeves. The sleeves are a little long, but I love that because I suffer from cold hands. I often have to wear mitts indoors because of poor circulation in my extremities. I've not had to wear mitts indoors when I've worn this garment. The detail in this pattern is gorgeous. From the beautifully turned hem, to the cable pattern around the pockets. The pockets are just deep enough to keep your hands warm, but I probably wouldn't use them for anything else other than possibly a handkerchief! 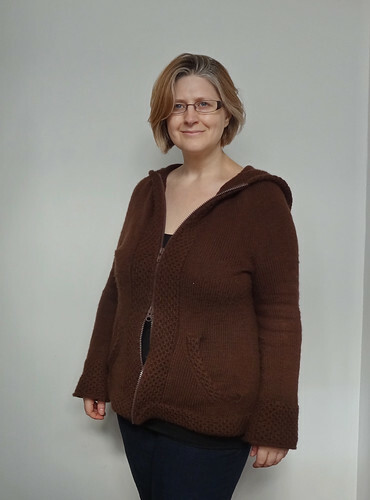 When I blocked the garment, after knitting, I used wires, and I angled the bottom half of the jacket outwards. This has, unfortunately, led to a little flaring of the hem. I think this will disappear after wearing it, as it is already less noticeable. When blocking the jacket, I used my polystyrene head form (that I use for blocking hats) and placed it in the hood. 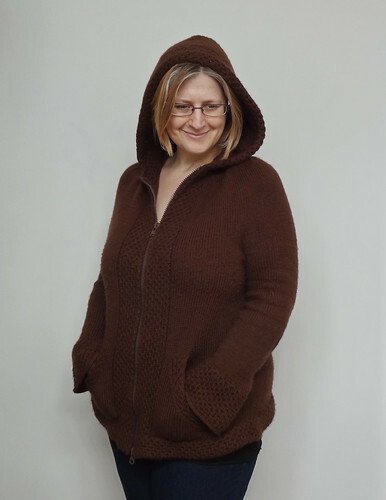 This pulled the fabric at the top of the hood into a nice soft shape that hid the short row shaping beautifully. The hood keeps my upper back and shoulders really warm, when it's not being worn up. 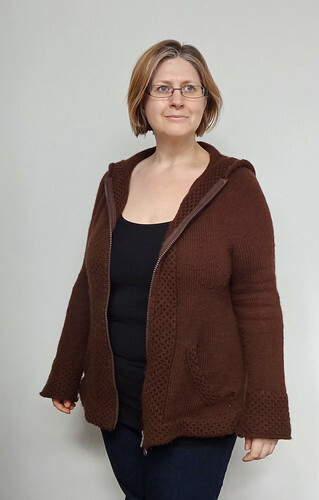 I love this jacket and I have been wearing it as much as possible since I finished it. 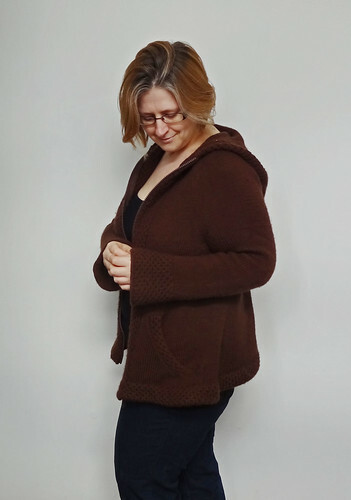 It is a wonderful cozy cardigan for Winter and it's a great light and warm jacket for Spring and Autumn. I could not be happier with how it turned out. I'm so glad I was finally well enough to take these photos to share, as I have been wearing it for a while now, but I didn't feel like the project was complete until I showed you guys! 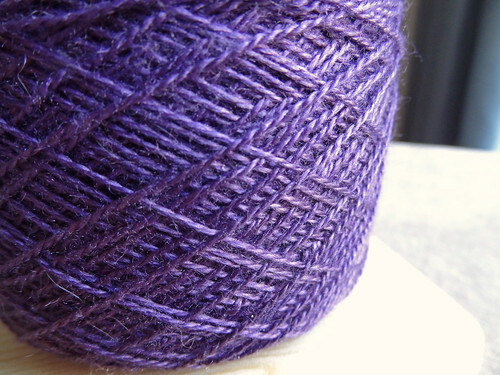 I can officially mark this off my list for Knit The Queue 2013 and Challenge To Myself. 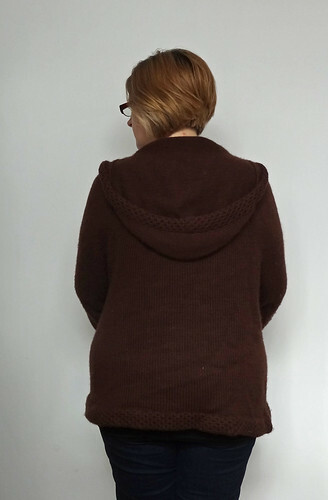 I've already pulled out my next KTQ2013 project, it's a kit for some stranded mitts designed by Bombella. The next CTM is the Dew Drops Shawl, which is being knit in Artisan Yarns Soft Silk Camel Lace. Hopefully I'll be able to take some photos of my progress soon.